Transaction of Today…July 29, 2008 – The Atlanta Braves traded Mark Teixeira to the Los Angeles Angels of Anaheim for Stephen Marek (minors) and Casey Kotchman. It was the moment that the Braves resigned themselves to admit that their swing-for-the-fence effort the previous July failed. On this day nine years ago, the Braves sent the dynamic first baseman, Mark Teixeira, to the Angels for a pitifully small package of talent considering what they had themselves paid a year before. It would be one of the few and final mistakes for a general manager who tried desperately to squeeze one final contending effort from his squad. John Schuerholz, who will be enshrined in the Hall of Fame tomorrow, overestimated the need for the Atlanta Braves. Fortunately for Atlanta, he was right more times than he was wrong during his 15+ years at the helm. Let’s flash back to 2007 because we simply can’t tell this story otherwise. 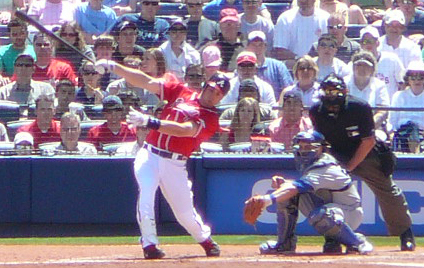 On July 29th, the Braves beat the Arizona Diamondbacks 14-0 behind seven wonderful innings from Tim Hudson, homers by Andruw Jones and Scott Thorman, and a five-RBI day from Chipper Jones. Thorman and Chipper Jones were joined by Edgar Renteria and Kelly Johnson up the middle on the infield. Meanwhile, Andruw Jones was flanked by Jeff Francoeur and a productive platoon of Matt Diaz and Willie Harris in left. Add in Brian McCann behind the plate and the offense was pretty darn good. Well, with the exception of Thorman and Andruw, who again both hit homers that day. The centerfielder from Curacao was coming off a five-year sample where he slashed .266/.352/.524 with nearly 200 homers. This included his 2005 near-MVP season. However, things just never got going for Jones in ’07 and he hit an abysmal .222/.311/.413. It would be the beginning of the end for him. Meanwhile, Thorman was struggling after being handed first base following the trade of Adam LaRoche. He would hit just .216/.258/.394 during the season and worse, Craig Wilson had flamed out after being brought over from the Pirates to help. The Braves first tried to use Jarrod Saltalamacchia, a top prospect at catcher, to help fill in and by mid-July, they acquired the 48-years-young Julio Franco after the latter was cut by the Mets. None of these options were exciting. Despite the holes at first base and center field, the Braves were 55-51 on the season and 4.5 games out of the division race and just a couple games behind the Dodgers for the NL Wild Card. John Schuerholz thought the Braves had one last run in them with the remaining core from those great Braves’ teams that routinely ran away with the division crown. John Smoltz was 40, Chipper was 35, and Andruw was 30. This would be the final summer all three would be with the Braves. So, Schuerholz pulled the trigger on July 31. With the young McCann in place, the Braves felt Saltalamacchia was blocked and better used as a trade piece. They then packaged Neftali Feliz and Elvis Andrus, a pair of exciting prospects who were a few years away from contributing, with Matt Harrison, a southpaw close to the majors with a middle-of-the-rotation grade. When the Rangers waffled on Harrison’s medical reports, Atlanta threw another prospect, Beau Jones, in the deal to smooth things over. Texas also added left-hander Ron Mahay in the deal to help out a Braves bullpen that had lost its best southpaw in Mike Gonzalez to injury. The Braves also added relievers Octavio Dotel and Royce Ring that day in other trades. The focus was clear. With Teixeira added to an already impressive lineup and a shutdown bullpen that also had Rafael Soriano, Peter Moylan, and Bob Wickman, the Braves were betting on being able to outhit the other team and shut them down late. All of this effort was to mask what was the 2007 Braves’ true problem – the starting rotation. In Hudson and Smoltz, the Braves had a pair of excellent pitchers who qualified for 51 quality starts between them. The rest of the team managed 30. The rest of the rotation read like a who’s who of bad pitchers who have started for the Braves over the last decade – Chuck James, Buddy Carlyle, Kyle Davies, Jo-Jo Reyes, Lance Cormier, Mark Redman, Anthony Lerew, and Jeff Bennett. All of these pitchers had a FIP of 4.78 or better. The 2007 Braves were the Spahn and Sain and Pray for Rain of a new generation. But the Braves saw a way – a very narrow path, I grant you, but a way to the playoffs. However, the dream crashed quickly. During a damp night on August 2, Renteria went deep in the hole after a ball hit by Ty Wigginton and came up lame. The Braves, who had already used their two backup middle infielders in Yunel Escobar and Chris Woodward, were forced to move Chipper Jones to shortstop. Renteria had a sprained ankle. Luckily, the Braves had Escobar, who had been sharing time with Johnson at second. Still, the Braves needed everything to go right for Schuerholz’s plan to work and Renteria going down wasn’t going to help. Neither did losing Dotel, who pitched just nine times after the deal. Atlanta pressed on, though. Before the arrival of their new teammates in Atlanta, the Braves blew out the Astros 12-4 on July 31 to improve to five games over .500. Atlanta actually did pretty well down the stretch, but bad luck and an offense that wasn’t quite as dynamic as advertised led them to a 28-27 finish (despite the second-best run differential down the stretch in the NL). Schuerholz hung up his GM reigns and passed the responsibility of getting the Braves back to the playoffs to Frank Wren. Wren completed a deal that first was brought up while Schuerholz was in charge, sending Renteria to Detroit for Jair Jurrjens. He added Josh Anderson, Will Ohman, Omar Infante, and Mark Kotsay as he navigated the little financial freedom he had with the needs of his team. He also approached Scott Boras and Teixeira about a new contract. Boras, notorious for pushing his players to hit the open market, helped to convince Teixeira to pass on the contract. It’s not known what that deal may have been, but here’s some context – Teixeira had declined a $140M, 8-year deal from the Rangers the previous spring. Teixeira would continue to hit like Teixeira. Over 103 games to open the 2008 season, Teixeira hit .283/.390/.412 with 20 HR. But the 2008 Braves were hopeless. Francoeur fell on his face, but worse, the pitching staff was again a failure. Smoltz went down early and Hudson went down later that summer. While the rookie Jurrjens was impressive and the Braves unearthed some surprising contributions out of Jorge Campillo, the rest of the staff was just awful. With the bullpen managing to convert just 26 saves, the Braves limped to a 45-50 start at the break. Selling was a real possibility for a team that often was buying at the deadline. After winning just four games of their first ten coming out of the All-Star Break, the Braves waved the white flag. The Angels came calling with an offer for Teixeira. They had failed to acquire the first baseman the previous summer but were now anxious to finally get their guy. They offered Casey Kotchman, but the Braves balked asking for top pitching prospect Nick Adenhart and a third player in addition to Kotchman. The Angels counted with Kotchman and a Double-A reliever, Stephen Marek, who wasn’t one of their best prospects by a mile and waited for the Braves to blink. It was a buyer’s market and they knew that. Ultimately, Wren couldn’t get enough action from Arizona, Tampa Bay, Boston, or the big pockets of the Yankees and Dodgers, to acquire something better. He accepted the Angels’ miserable offer. Kotchman wasn’t a terrible consolation prize, though. He had hit .296/.372/.467 the previous year, his first as a full-timer in the majors. He was also hitting .287/.327/.448 at the time of the trade and at 25 years-old, wasn’t far removed from being a top prospect in all of baseball. His numbers with the Braves were never that good, though. He slashed .267/.346/.378 as a first baseman in the National League – which wasn’t acceptable. The Braves continued their revolving door at first base by trading Kotchman the next trading deadline for Adam LaRoche, the guy whose original trade opened the door for Thorman, whose poor play prompted the trade for Teixeira in the first place. Marek made it to Triple-A, but never appeared in the majors. His career was over after 2012. Meanwhile, Teixeira would help the Angels get to the playoffs, where they would lose to the Red Sox in four games. He then signed for $40 million more than the Rangers had offered two years before when he joined the Yankees for an eight-year, $180M contract. The Angels made out okay, though. They offered Teixeira arbitration after the playoffs and after he signed with the Yankees, the compensation pick turned into the #25th overall pick of the 2009 draft. Which turned into Mike Trout. Which turned into the tears of Braves Country. The second Teixeira deal is a tough one to swallow – both for the players the Braves surrendered to get him and the package they received. Nine years ago today, the Braves tried to get anything – anything at all – to soften the blow the pending loss of Teixeira would bring. Ultimately, it didn’t do that. It just made it more clear how things went the wrong way from the moment Teixeira was acquired.